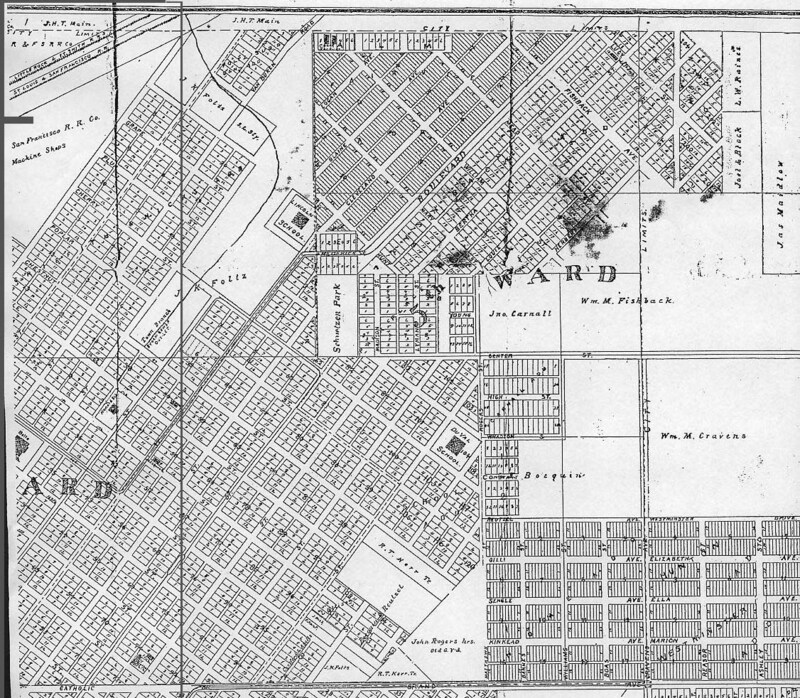 Section 2 of this 1894 map of Fort Smith depicts the streets, layout and landmarks of what was then northeast corner of Fort Smtih. In the upper left hand corner of the map, Town Branch wends its way toward the Arkansas River from downtown Fort Smith. By most accounts, Town Branch originated at some point on Towson Avenue and made a turn somewhere between the junction of that street with Catholic Avenue and North Seventh Street where it re-emerged in 1894. In the early 1890s, the city paid a contractor to brick it over to that point. The brick water conduit allowed the remaining gully to be filled in and built over. Town Branch was a constant problem in a storm or heavy downpour. Heavy precipitation was cause the water flow in it to jump the banks and flood the eastern end of downtown. Today, some longtime residents claim that when North 10th Street floods near Garrison that the Branch is still defiantly working its mischief. At the junction of 10th and 11th streets and the "Boulevard" (Midland), Schuetzen Park once provided space for German-American to practice target shooting with cchuetzen rifles, a type of firearm popular with German-Americans from 1870 to 1916. The park once was the site of African-American celebrations and firefighting competitions as well. The park disappeared sometime in the early 20th century, overtaken by development. Lincoln School, the black school in Fort Smith, was nearby. The land of its campus today is the site of Howard Elementary School, named in honor of a prominent, national Freedmen's Bureau official, O.O. Howard. The John Rogers Graveyard at the bottom edge of the map now is the site of Darby Junior High School.